Mvix, an industry leader in HD digital signage solutions announces its partnership with industry leading financial institutions to offer financing and leasing programs for small and medium-sized clients. “Our financing options will allow franchise-based owners and managers to conserve their working capital and preserve their credit lines,” stated A. Jay, Director of Business Relations at Mvix. Mvix, an industry leader in HD digital signage solutions has partnered with industry leading financial institutions to offer financing and leasing programs for small and medium-sized clients. The program will make it easier for its SMB to adopt digital signage by streamlining the financial processes. Digital signage systems are programmable digital screens that can be used in place of traditional paper or backlit signage. They can consist of a single screen and controller and can be installed for only a few hundred dollars. However, as systems get more complex, such as multiple screens, video walls, and display grids working in tandem with multiple networked controllers, the systems can be more of a financial burden, especially for smaller firms. By partnering with established equipment financing firms, Mvix can have an organization approved for 100% of equipment costs in only a few hours. This program will also make it easier for clients to access more flexible options, such as step-leases and lease-to-own options, which enable financing to be tailored to the income level of the client. Mvix, based in Sterling, Virginia, was founded in 2005 and has become one of the industry leaders in the field of cloud-based digital signage and menu board solutions. With over 9000 clients in over 25 countries, Mvix has established itself as a dominant player in the affordable digital signage market. 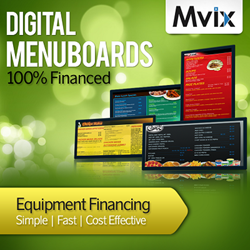 To learn more about Mvix’s diverse line of digital signage solutions, call 866-310-4923 or visit: http://www.mvixdigitalsignage.com.